Every month, a half dozen or so members of the Seattle Chapter of the American Sewing Guild set up shop in the basement of the Ronald McDonald House in Seattle. They drop off forty hand-made pillowcases at the front desk for families to pick up. They mend torn clothing that families bring by and fix torn mattress covers or pillow protectors. 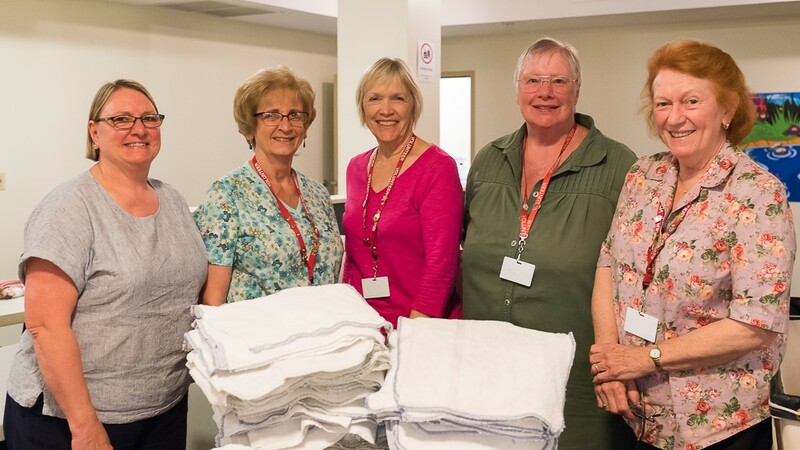 But their biggest project — the one that’s always waiting for them — is turning worn-out linens into hundreds of rags for use by the facilities staff. The group has been coming since 2009, when they donated an initial batch of pillowcases to the House as part of a larger project by the ASG. After learning more about the House, they decided to make a regular commitment to helping the House however they can. With their services, they provide a valuable service to families and help the House save on linen costs by re-purposing old items. For the first few years that they visited the House, the sewing group worked from a conference room near the House’s administrative offices. A few years ago, they moved down to the basement, which allows them more opportunity to talk to families. The pillowcases, with their bright colored fabric, always attract attention from passers-by. The group’s membership doesn’t change often, so they’ve grown close over the years; the time they spend volunteering is also a chance for them to catch up and socialize. The group comes from all over the Seattle area, and at the July meeting, there were members from Burien, Everett, West Seattle, and right across the street from the Ronald McDonald House. What keeps the group coming back to the House? A few things: an appreciation for the craft, the chance to talk about it with other people, and the opportunity to use their talent for a good cause. “We just love to sew,” says Claudia Smith. Interested in learning more about the Seattle chapter of the American Sewing Guild? Check out their website. And if you would like to know how to help out at the House, please visit our Volunteer page.